When Rye grandmother Penny Berkshire had a stroke last year, she was left paralysed on her right side. However after working with the rehabilitation team at Golf Links Road and completing the Stroke Detours Program, she can now walk again, drive again and is hoping to be back on the golf course soon. “I had the stroke on 20 June last year,” recalls Penny. It wasn’t until she got to Frankston Hospital that Penny knew she’d had a stroke. “I didn’t realise what stroke was like. I didn’t realise it affected anybody, of any age,” says Penny. When she went home, allied health staff from the Stroke Detours Program were there to help with her recovery. “The Stroke Detours team that came to my home were fantastic!” she says. 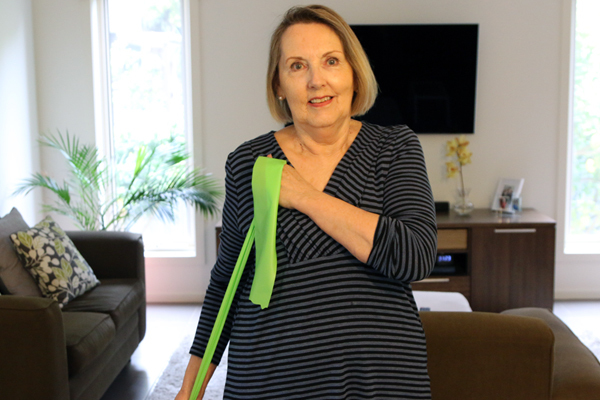 A year on, Penny is still doing exercises the team at Peninsula Health taught her, and has made a remarkable recovery. She has some advice for other people who have a stroke. + Stroke is the second biggest killer of Australian women and kills more women than breast cancer. + More women than men die of stroke. + Women tend to have strokes when they are older.